Aren't they so cute? My favorite thing is that there's a different one for whichever mood I'm in at the moment.haha and they're only between $12.99 and $14.99! I'm sure you can relate, but I grew up with one of those cupboards in my house with all the fun miss-matched mugs, and my favorite one I remember was a white mug with a lobster on it that would go from dark brown to bright red when you filled it with a hot liquid.haha But I loved choosing other ones too, it just makes hot treats all the better to have a mug that makes you smile don't you think? Do you remember your favorite mug growing up? Do you have one of those cupboards now? 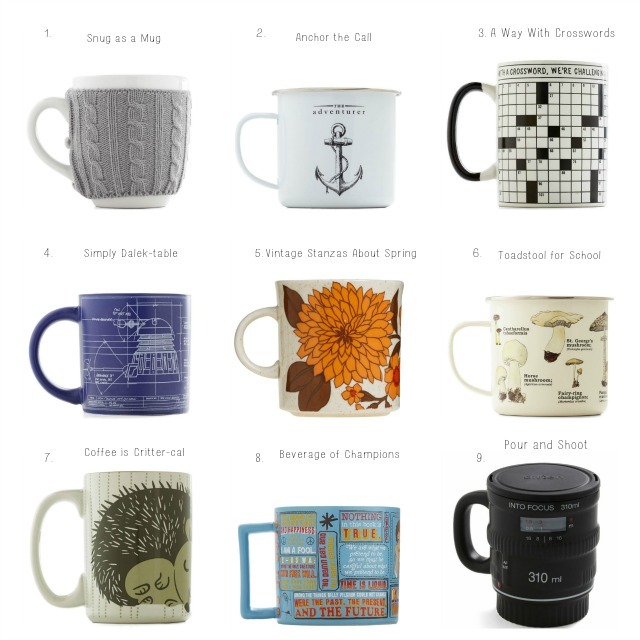 I'm working on ours, hence the mug collection:) Which is your favorite? Thanks again for reading, and I hope you have a great rest of your week! Dicslaimer: Just so we're all clear, this post does contain some affiliate links but I'm not getting paid and was not asked to do this, I just genuinely wanted to share there these fun mugs I've been wanting lately with you! Thank you for your constant love and support! I have a very large mug collection already. When I have my own house I'll be all set. One of my favorite mugs growing up was my coffee bean mug. It had textured coffee beans all over the mug. Another one of my favorites was the authors mug with many famous authors all over it. Love #'s 1, 2, 3, and 7! I'm a big mug hoarder and every time I see a mug I want it! How can you ever have too many?? I have two favorite mugs: one is the Office's Dunder Mifflin logo, it's the perfect size and thickness, and keeps my coffee perfectly warm; the second is a fiesta ware peacock blue 10z mug, which is a little small, but does well for my teas because of the thick walls. I especially like the adorable little circle handle that makes it so fun to hold. I am a total mugaholic. I love all of those mugs!!!! I especially love the vintage one! I love the mugs. I have a collection of christmas mugs some used to play christmas songs. Uhm, I love these! I'm thinking that I need the anchor one! I'm working on one too! I'm a couple short though, so i need to find a few more. I love the snug as a mug, so cute! I have a whole cupboard full of mugs -- it's bordering on problematic. My favorite one is the one I have from working at Seattle's Best inside of a Borders bookstore. All of my best friends worked there when it was still open and drinking from it reminds me of them. The happiness that this post brings me is beyond words! I have a love of eating ice cream out of mugs, and have amassed quite the collection! One of my dear friends bought me one of those collage mugs once. It said right in the middle, "Things I Love," hideous graphics...and surrounding it was pictures of people i loved. (ironic) ...my husband, my college roomates, Michael Buble', America's Next Top Middle Logo, the original cast of Glee, my sister...lots of pictures...I STILL drink out of that mug everyday...So ugly, but sooo meaningful. So cute! I want them all. The mug cozy is my favorite. My favorite cup right now is a giraffe print mug with a little ceramic giraffe inside as a surprise when your drink gets low enough.